Definition at line 105 of file CFLAndersAliasAnalysis.h. Definition at line 912 of file CFLAndersAliasAnalysis.cpp. Definition at line 921 of file CFLAndersAliasAnalysis.cpp. Definition at line 113 of file CFLAndersAliasAnalysis.h. Definition at line 114 of file CFLAndersAliasAnalysis.h. 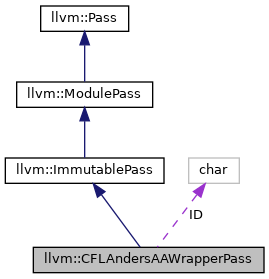 Definition at line 916 of file CFLAndersAliasAnalysis.cpp. Definition at line 109 of file CFLAndersAliasAnalysis.h.